As Paulo Blikstein noted “Innovation and collaborative problem-solving are core skills for virtually any career, and yet those are the very elements that have been pushed out of the schools by the mandates of standardized testing.” If you’re a parent who is frustrated by this, perhaps you sign your child up an after-school robotics class, or you register for an online program such as DIY.org, or maybe it’s a kind of hybrid plan and you order your daughter (or son) a Blink Blink creative circuits project kit. If you’re a teacher, maybe you sign yourself up for a professional development event, such as “Project-Based Learning Integration: From Design to Evaluation” held on June 9 at the Beam Center. It was refreshing to witness the engagement of about 30 educators while learning about the background of project-based learning (PBL) and digital fabrication and working together to brainstorm appropriate projects. Not only did we learn about how maker spaces need to be designed for optimal impact, but we also personally experienced first-hand some of the challenges of designing effective projects. The evening’s session was hosted by Brian Cohen, Co-Director of the Beam Center and facilitated by Nancy Otero, Director of Professional Development. The Beam Center, located in the transitioning industrial waterfront of Red Hook, has a number of different offerings, ranging from collaborative projects with kids, working with schools to develop their own programs, and professional development. Their programs include after-school workshops for elementary school children and programs for high school students in which they collaborate with engineers and artists. Beam Camp is held in Strafford, New Hampshire and includes both full summer sessions as well as one-month experiences that are focused on a new and unique building project for each session. Space matters: As David Kelley of IDEO has pointed out, “We read our physical environment, like we read a human face.” Otero stressed the importance of making learning spaces gender neutral and accessible, with ample examples of what types of projects are possible. CREATE: According to Otero, successful projects share the following characteristics. Child Direct: Let students choose, be curious and lead. Risk Friendly: Encourage successful failures. Emotionally Attuned: Praise process rather than people. Active: Judge activities by tinkerability and playfulness. Time Flexible: Help students find and stay in flow. Of the projects developed to date, 90% appear to be in the category of electronics, vehicles and robots. Order matters: In designing learning activities, studies have shown that students learn better when given the opportunity to experiment and then are provided with instruction. Think of the flipped classroom methodology. Experiments by Schneider and Blikstein show higher performance on tasks when students are allowed to discover for themselves rather than having to first listen to instructions on how to perform the tasks. As we found out, designing such projects has its challenges. Walking around the room as smaller groups worked through the process of planning sample projects, Otero encouraged active brainstorming and discouraged the tendency to lead with technology. She challenged groups to focus on individual concepts that students could learn while working through projects that ranged from urban design, working with fractions, and conductivity. What did we want the kids to learn? What’s ahead for PBL and Digital Fabrication? While a growing range of opportunities exist outside of school for PBL in after-school programs, maker clubs and spaces, in online programs and within the homeschooling and unschooling communities, Blikstein’s comments continue to ring true. Hopefully, with programs such as those at the Beam Center and the growing DIY and Maker movements, one day we will prove Blikstein wrong and see this type of innovation integrated in the schools as well. I think he might be OK with that. This entry was posted in Contextualized learning, Design Thinking, Educational Technology, Girls, K-12 Education, Learn by doing, Learning Design, Maker Learning, STEAM on August 23, 2015 by Sheri Handel. Several articles in the past couple of weeks have highlighted the methodology of design thinking for both the business environment and education, particularly higher ed. Fast Company provides a quick reboot for those who may need a refresher in“Design Thinking . . . What is That?” The Chronicle of Higher Ed provides a more in-depth examination of the place of design thinking in higher ed in “Is ‘Design Thinking’ the New Liberal Arts?” The Chronicle piece details the popularity of “d. school” classes amongst the general populous at Stanford and discusses the potential to extend the model to college education in general. I’ve written before about the value of the design process in K-12, as executed by groups such as Tools at Schools, for example, and the great partnerships that collaborate to bring businesses into the schools to help engage students in more extended design projects. This week I’m prompted by the current focus on design thinking to review some of the benefits for emerging adults (aka high schoolers) should more design thinking be applied to curricula in exchange for traditional grading and testing methodologies. If we take a look at each stage of design thinking methodology, we can see how this process builds skills that a curriculum based on high stakes testing cannot. 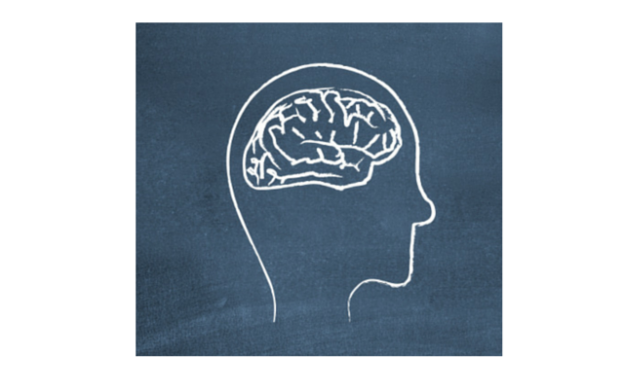 Empathize: Incorporating empathy into the process of learning can have huge benefits. As we listen in order to uncover partner, client, or subject needs, we are practicing an invaluable skill. I’m reminded of my hero, Paulo Freire and how he utilized the tools of dialogue and problem solving to the learning process. Learning how to respect your partner in the dialogue that begins the design process can not only further engage your learners in the current design activity, but will have powerful, long-lasting effects that no amount of preparing for an exam can. Define: The process of uncovering needs, documenting and then synthesizing these findings requires critical thinking skills of the highest order. Applying these skills to a real-world problem beats practicing test questions any day. Ideate: This is where creativity really kicks in and learners get to generate means of addressing the problem. With everyone chipping in, and with a sticky note (or white board, or newsprint) array of potential solutions, a great volume of ideas may result. Essential to this step of the process is the belief that “no idea is too stupid,” a concept that any student in a traditional school setting can tell you is not usually practiced. Sorting through and finding the main themes that arise are also a great way to practice problem-solving skills in an authentic manner. Test taking requires a very discrete set of skills that tend to stifle rather than nourish creative problem solving. Prototype: Creating a physical prototype of either one aspect of or the entire solution and responding to feedback on it provides opportunities for applying a range of skills that test practice does not. Building something out of paper, markers, wood, metal, etc. results in a project deliverable that may in some cases evolve into the actual end-product solution. Test: Listening to feedback from others, probing further and applying that to a refinement of a solution will serve our kids well as they move on to the workplace. The advice from the d. School is “Don’t defend your prototype; instead watch how your partner (client/user) uses and misuses it. Again, this provides so much more valuable experience than filling in a bubble sheet or staring at a computerized version of the same exam. As school districts and families struggle with adherence to or rejection of new test-driven curricula, the idea of engaging our kids in more productive and authentic learning experiences becomes more attractive. As each year of high school juniors and seniors waste months in mostly solitary preparation for one of two (or both) standardized tests to sum up the value of their 12 years of schooling, considering alternative ways to practice and build real-life skills becomes increasingly important. As you have probably surmised, design thinking in K-12 will best be realized when schools effectively partner with experienced practitioners as well as corporate sponsors and mentors to help students through the different phases of the process. I’ve written before about Tools at Schools, the brainchild of cofounders Don Buckley, Rinat Aruh and Johan Liden. They have partnered with Puma, for example, to work with students designing “The Sneaker of the Future” and with faculty at the St. Mark’s School in Boston to rethink “STEM to STEAM” amongst other projects. Design thinking is being applied to classroom curriculum as well as professional development and curriculum design. Juliette LaMontagne, founder of the Breaker projects, is helping to re-engage youth (14-26-year olds) in the learning process by working through regionally-based, real-life design projects , such as the “The Future of the Book,” “Urban Micro Agriculture,” “Technology for Civic Engagement,” and “The Future of Stuff.” Students who have participated in Breaker projects talk about how devoted people are to the projects, how hierarchies vanished as part of the project process, how student-focused the work was, and the great benefit of working with industry mentors. In many districts and schools across the country, faculty are engaged in projects to re-design or even re-envision school. Imagine if the $1,000 or so spent per PAARC exam question were re-channeled to building design thinking into our standard curriculum model. Clearly incorporating design thinking into a curriculum or even considering revamping a school curriculum around this concept requires planning and resources that many schools may not currently have access to. That’s why the partnerships are so important. When we consider what is really at stake, we must continue to push for further change. If you’re interested in exploring the design process further on your own, or within your school, the d.school has a virtual crash course in design available for anyone to take you, working with a partner or group, through a full design cycle. Or use theFuture of Stuff Challenge resources to engage in your own manufacturing challenge (or one of your own . . . design). This entry was posted in Alternative Learning Approaches, Common Core Curriculum, Design Thinking, Engagement, Experiential learning, K-12 Education, Learn by doing, Learning Design on April 7, 2015 by Sheri Handel. Listening. That’s the big idea. It may be a simple idea, but it’s one that doesn’t seem to be common practice these days. While we all agree there are problems with the current educational system, there seems to be little agreement as to the specific nature of the problems or of how to solve them. Ask the right questions. As learning designers, we know how to devise the right questions to prompt a conversation around what is missing and how to get there. We need to get back to asking the questions before we provide the answers. Use silence to its best advantage. Some people are uncomfortable with silence, but in the moments between asking your brilliant questions and your target audience responding to them, some powerful thinking is taking place. I’ve been nudged plenty of times but held my ground and been pleased with the results. Bring the right group of people together to make the conversation meaningful. I’ve written about the fantastic partnerships taking place between the public and private sector these days. Business and technology are finally at the table. Let’s just make sure that the voice of today’s educators and today’s students continue to be part of the mix. Gaming to enhance engagement, etc. These solutions all have great potential to change the way we approach learning in PK-12, higher ed and in the workplace. But before we start throwing money and code around any further, can we stop for a minute to listen? 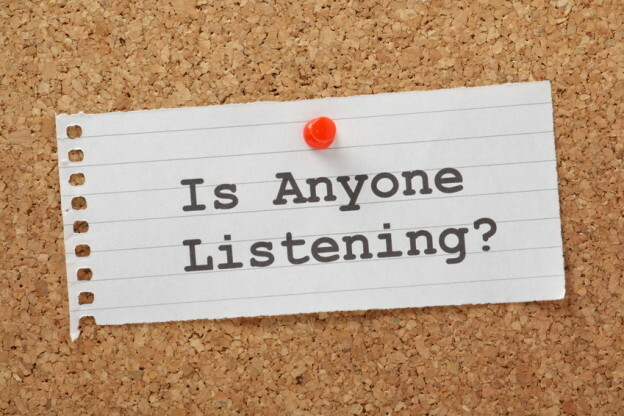 That’s my big idea for 2015, to start a campaign for listening. And I’m going to launch that campaign right here and right now with a focus on PK-12. If you are interested in having your voice heard, please share your top three concerns with us in the comments section, or, better yet, take a few quick minutes to submit your responses to our quick Education State of the State Survey here. Visit Designs2Learn for more on how we can partner with you for improved learning design and results. This entry was posted in Design Thinking, Learning Design on January 5, 2015 by Sheri Handel. We traveled to Boston from NYC this past weekend for a college audition, and walking around Back Bay found the above exhibit at the Boston Architectural College. 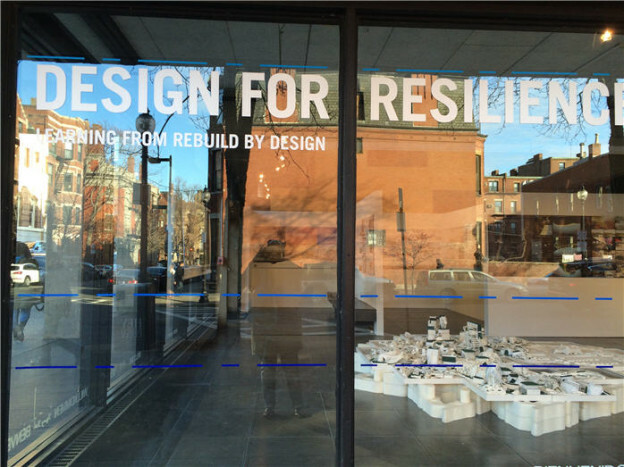 From the exhibit catalog, “Design for Resilience asks us to think, discuss, and take action as we consider how to better connect ourselves to our ecology and our infrastructure to ready ourselves for the future. . . Rebuild by Design has been answering these questions of resilience – the ability to withstand, adapt, and recover from shock – with an innovative process that relies on unprecedented collaboration to create unique solutions for a stronger tomorrow.” The words struck me as particularly apropos to our kids transitioning from high school to college (or whatever alternative path they might select). How can we prepare our young people to move forward and be productive contributors to society, for their sake and for ours? How can we design the PK-12 experience to make such transitions less shocking? Incorporate more practical components into the curriculum. Some colleges include housing options for senior year that are meant to prepare students for leaving the relative safety and comfort of the campus experience to “the real world.” That’s not a bad thing, but let’s start sooner and teach kids about personal finances with exercises about budgeting, health care issues, etc. earlier on so that the shock of leaving home for college is not as severe. Prepare more directly for the rigor of college academics. So many kids arrive at college unable to manage the workload due to either the sheer volume of reading assignments, papers or projects; or due to a lack of preparedness around the specific skills required to attach such assignments. A focus on the specific research and writing skills required would be a great asset to kids before they leave high school. Whether a course or a toolkit for preparation and later use, kids need more tools at their disposal to make it out there in higher ed and then on the job. Focus more on the decision-making skills one needs to survive once away from home. From selecting courses, to taking on extra-curricular activities and dealing with the social aspects of college living, scenario-based learning exercises could go a long way to lessening the shock once faced with these realities. “Designing for resilience” from an educational perspective means taking on a more practical approach to curriculum and learning design. By incorporating existing tools from what is currently available, or adding to them with more specific materials for this target audience, we should be able to provide helpful tools for moving forward. Just as workplace learning is now designing and curating learning experiences for employees to focus on more hands-on and continuous learning, so should we incorporate similar strategies into the PK-12 learning space.Backward planning from the workplace, to college life and even to the PK-12 years can help better prepare young people for the realities they will face. And we’ll all be better off as a result. Stay tuned to Designs2Learn for more on how resilient learning design can better prepare students for a place in tomorrow’s workplace. This entry was posted in 70:20:10, Blended Learning, Collaboration, Contextualized learning, Continuous learning, Design Thinking on January 5, 2015 by Sheri Handel. In an earlier post, I wrote about Johnny, a student who couldn’t sit still and for whom I proposed a curriculum that included less time in his chair, more time spent on projects and out of the classroom, and the involvement of more outside expertise. As many of us devote our time to considering potential curricular changes to help empower this generation of learners, there’s also a great team of people considering the environments in which people learn and work. Today I watched a wonderful webinar presented by Inside Higher Ed, called “Beyond the Classroom: Changing Culture Through Environment.” Representatives from Steelcase Education, The University of Southern Mississippi, and betauniversity shared examples of the types of design thinking and projects that focus on making space more effective for learners and employees. Many of the examples shared during this webinar focused on higher ed and corporate environments. We can draw a few simple rules from the design thinking that goes into making these places more conducive to thinking (learning and working) and apply them to the ongoing evolution in PK-12 educational practices that we see today. Make the space adaptable. The range of activities that take place during any one day requires different types of interactions between the teacher and the class, between the teacher and any one student, and between pairs and groups of students. Furniture that can be moved around can help facilitate this range of activities. Create zones within the classroom for different types of engagement. Even while accounting for flexibility in desk configuration, for example, there is a good case for creating zones of learning to facilitate some of the major interactions that take place each day. We’ve talked about blended learning design before, where the curriculum includes individual, group, and full-class activities. 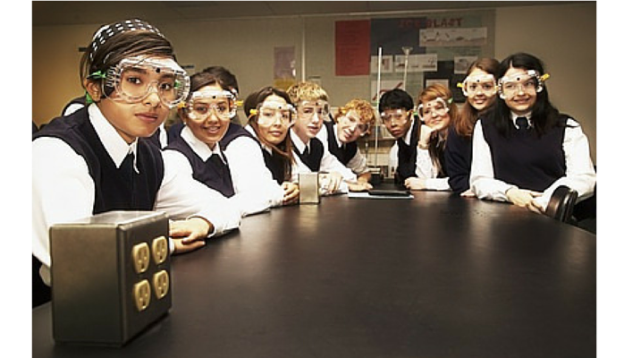 The classroom itself should have spaces where such activities can take place. Allow for ambient stimuli to help the mind wander. I’m lucky enough to have my desk in a room with a window with a view of the Hudson. I get up many times a day to look out that window while working through different design and business challenges. If you’re not fortunate enough to share my view, or that of the treetops, or anything natural, then a small space with comfortable seating and pictures of peaceful environments might do the trick. Democratize the sharing of information. While removal of the “sage from the stage” has resulted in less lecturing and more engagement between teacher and learner, the physical placement of whiteboards and visual displays within the classroom environment can allow for equity amongst the group and encourage collaboration further. The height of such displays and the group’s access to them can make a difference in the learning experience. Vary the types of seating and provide opportunities to work standing up or even reclining. 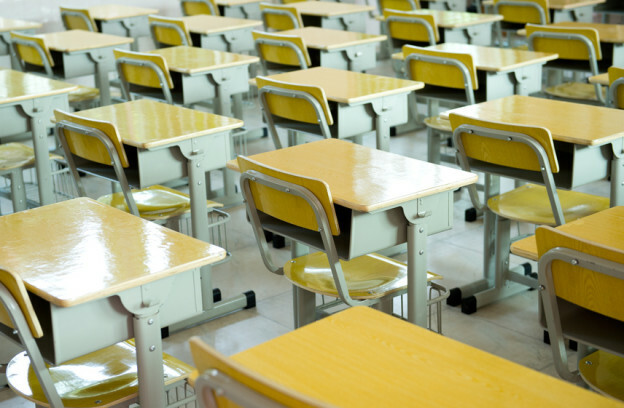 Just as most students don’t feel comfortable sitting in rows all day long, neither do they benefit from the stiff wooden desk that fill most classrooms today. A sofa, some bean bags, chairs that rotate to allow multitasking are just a few alternatives that may contribute to clearer thinking and more engagement. Thanks again to Inside Higher Ed and particularly to Andrew Kim from Steelcase Education for the insight. You can check out the hashtag #powerofplace on Twitter for more on this topic. Stay tuned to Designs2Learn for more on the application of design to positive impacts on today’s evolution in education. This entry was posted in 70:20:10, Blended Learning, Contextualized learning, Design Thinking, Learning Design on January 5, 2015 by Sheri Handel.